Sunday night I went to see The Flaming Lips in concert. It was absolutely the most entertaining concert I’ve ever attended. 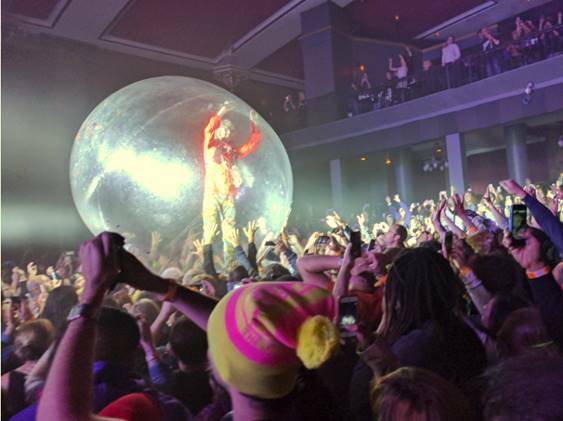 I’m not sure what was more amusing—having the singer come down into the audience riding a chariot driven by a unicorn, or when he got into a giant plastic ball and rolled into the audience. I’m still picking confetti out of my hair. Anyway, after an evening with The Flaming Lips, this article from Merriam-Webster, “12 Words That Secretly Come from Body Parts,” seemed like the perfect fit. About the Word: Sarcasm, that verbal flourish beloved by supercilious people the world over, has the sort of origin that makes other words jealous. It is descended ultimately from the ancient Greek word sarkazein, which means ‘to tear flesh like dogs’ (or also ‘to bite the lips in rage’ or ‘to speak bitterly’).